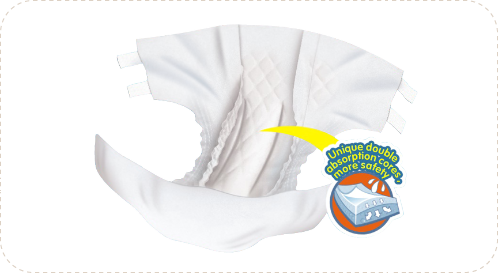 3D leak prevention channels to ensure zero leakage, wearer can move freely 3D leak guards are built in both sides of an adult diaper to protect side leakage and ensure freely move. Special embossing to ensure rapid distribution and absorption The absorption core is embossed innovatively, so that the urine can be distributed and absorbed quickly. Fresh perfume contents are used to reduce body odour The absorbent layer with additional fresh perfuming content can odour and inhibit the growth of bacteria. Unique double absorption cores, more safety Partially adopt the patent of double absorption pad, big absorption pad guide the fluid while the small pad hold the fluid quickly. Two pads work harmoniously to ensure safety absorption. "8" shape absorption core, more comfortable The well-cut "8" shaped core is according with ergonomic principles, fitted and comfortable economic adult diapers. Breathable nonwovens to release moisture High quality raw materials with breathable structure are used to help moist to be released rapidly. Help skin well breath and not hot. Super absorption system to hold the fluid quickly Super absorption system, which is composed of imported fluff and SAP, can hold and absorb urine quickly to supply solutions for incontinent people. 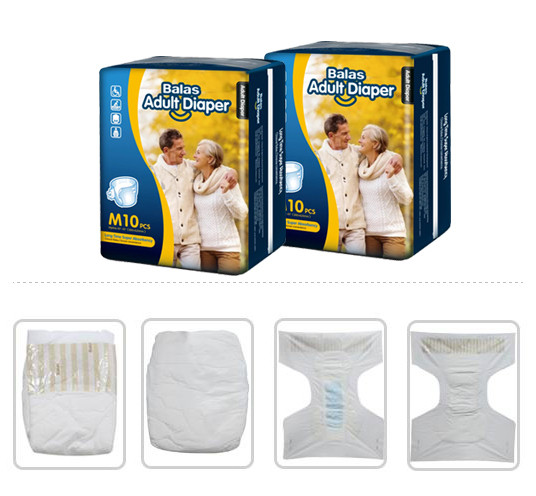 The rear side of absorption core is widened to improve backward leakage trouble.Balas adult diaper is more discreet. Extra widened absorption core well reduces backward leakage.